Disney's Art of Animation Resort is a relatively new hotel on Disney property, but its construction may have taken longer than any other resort. Construction began as part of Disney's Pop Century Resort, which is located across Hourglass Lake. It was supposed to be known as the Legendary Years—those years from 1900 through 1949. As fate would have it, when Disney's Pop Century Resort opened in 2003, the Legendary Years portion sat empty and abandoned, probably because of the halt of tourism following the September 11 attacks in New York City. In 2010, the empty buildings were re-purposed, and construction resumed on what is now a completely new resort, Disney's Art of Animation Resort. There are four areas, or four film franchises represented here: Cars, Finding Nemo, The Lion King, and The Little Mermaid. You begin your journey into the art of animation when you arrive at Animation Hall, which contains the main desk, the main merchandise facility, Ink & Paint Shop, and the main food court, Landscape of Flavors. There are three swimming pools at this resort, but the main pool, The Big Blue Pool, is located directly behind Animation Hall. 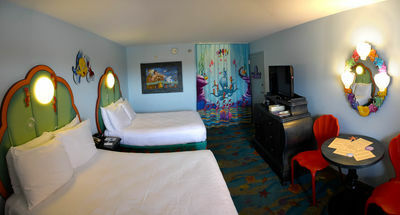 Since the guest rooms in this area are themed after Finding Nemo, so is the pool. 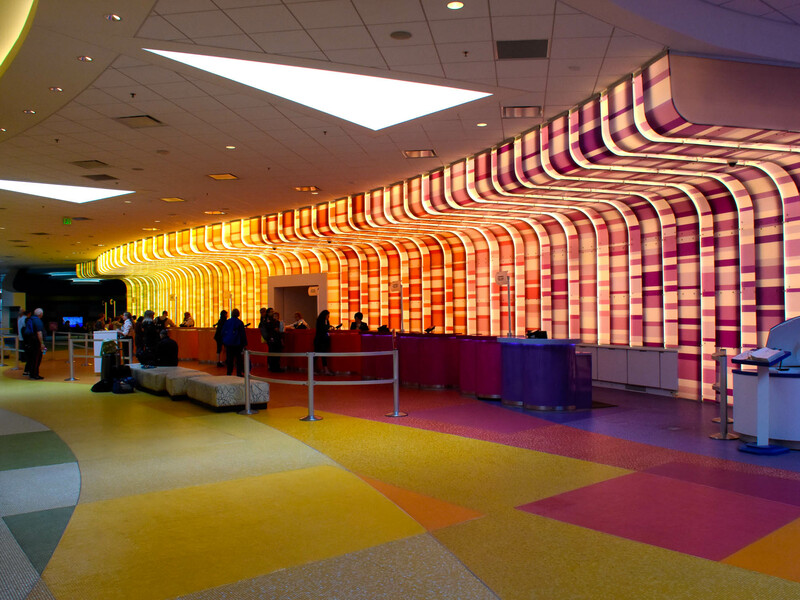 The lobby of Disney's Art of Animation Resort is colorfully lit. Photo by Donald Fink. 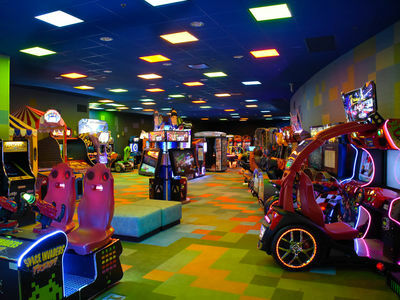 Pixel Play Arcade is located in Animation Hall. 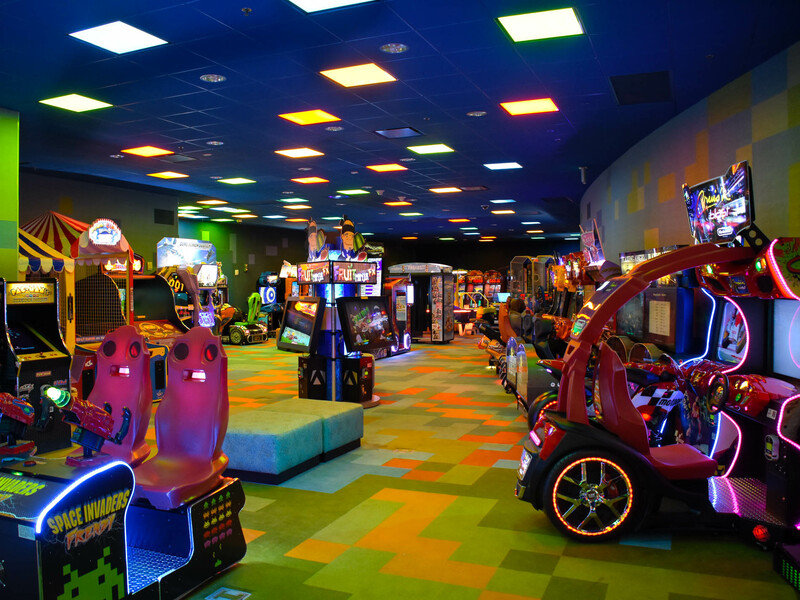 Like most arcades in Disney hotels, this one is reasonably complete and good for some amusement if your kids have some down time. Photo by Donald Fink. 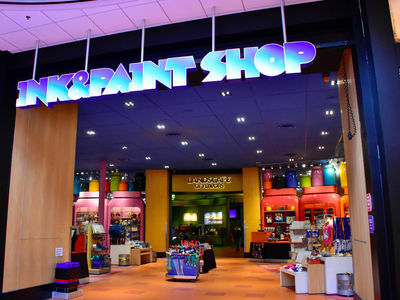 The Ink & Paint shop has Disney Merchandise as well as snacks and wine. Photo by Bonnie Fink. Typical of a Disney value hotel, there are toasters and microwaves available in the food court if you'd like to bring your own food. Photo by Donald Fink. 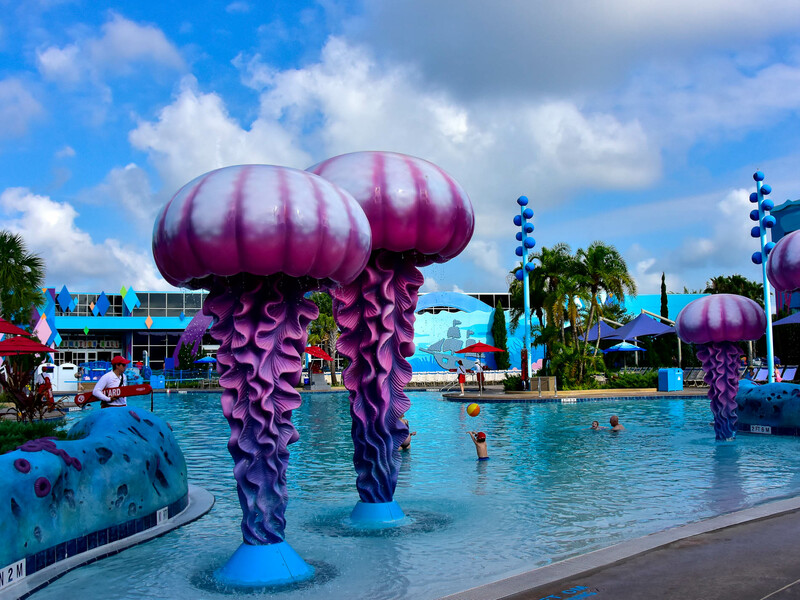 The Big Blue Pool can be found next to the "Finding Nemo" section, located directly behind Animation Hall, which is the main lobby of the hotel. Because of its proximity to the "Finding Nemo" section of the hotel, this pool has an underwater theme. Photo by Bonnie Fink. Schoolyard Sprayground is a great place for the younger set to cool off. Photo by Bonnie Fink. 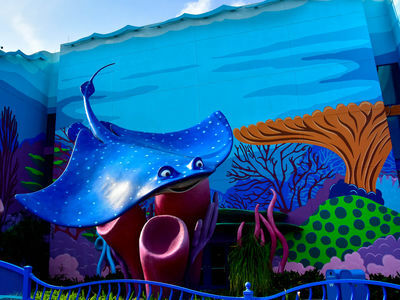 Mr. Ray can be found in the "Finding Nemo" section. Photo by Bonnie Fink. 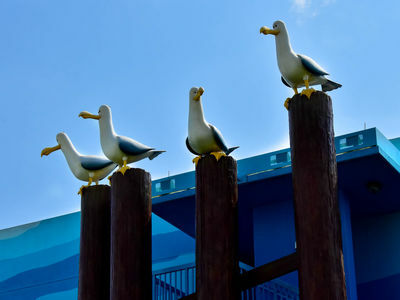 If you look up as you pass through the south side of "Finding Nemo" on your way to "Cars," you'll see the seagulls. If you pass by at the right moment, you can hear them screaming, "Mine, Mine, Mine." Photo by Bonnie Fink. Crush and Dory can be found outside the entrance to building 5, which is on the north side of The Big Blue Pool. Photo by Bonnie Fink. 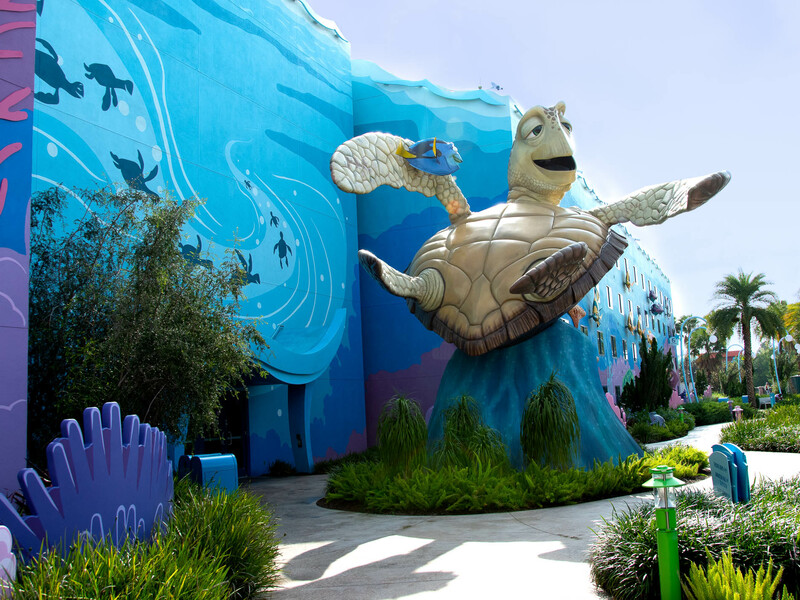 The Little Mermaid section of Disney's Art of Animation is the farthest from Animation Hall. It has the third pool on property, called Flippin' Fins, and is themed after characters from The Little Mermaid movie. This area is the only section in Disney's Art of Animation that has "standard" rooms. The other three sections are comprised mostly of family suites, which may explain why this hotel tends to be a bit more expensive than the other value hotels on Disney property. The thought must be that more people can be accommodated in the suites, so larger families will experience a slightly greater value here. 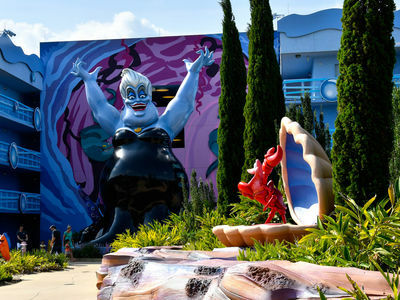 "The Little Mermaid" section has standard rooms, while the other sections are mostly family suites. Photo by Donald Fink. 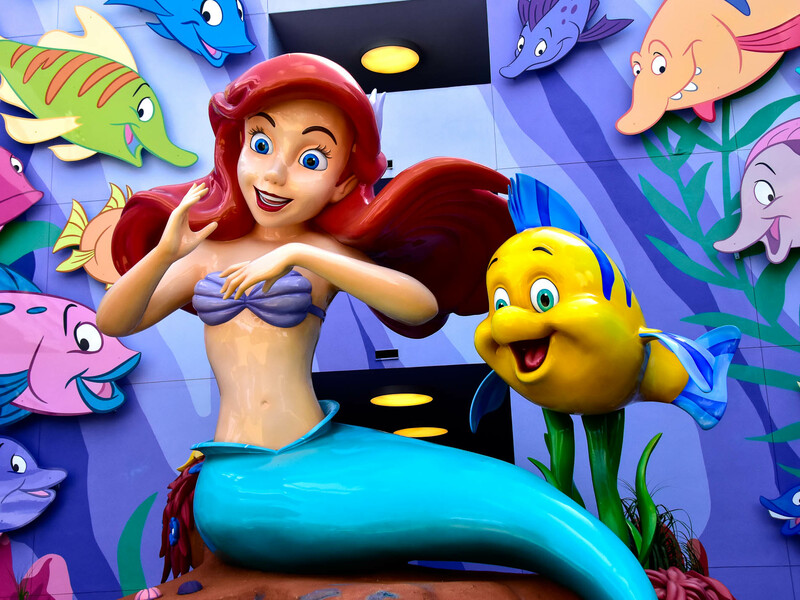 Ariel and Flounder are at the entrance to building 8. Photo by Bonnie Fink. 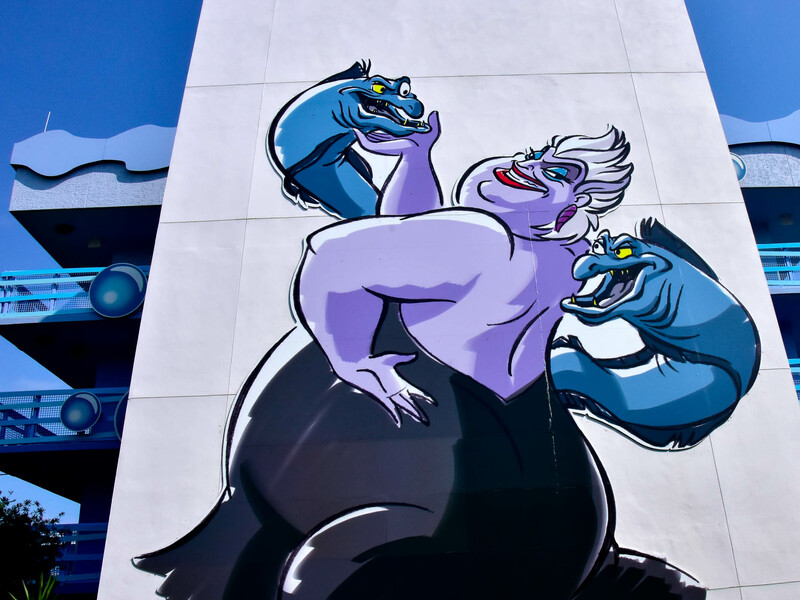 Ursula is at the opening of building 7. Photo by Bonnie Fink. If you take a stroll around Hourglass Lake, make sure to look at the great artwork decorating the buildings. Photo by Bonnie Fink. 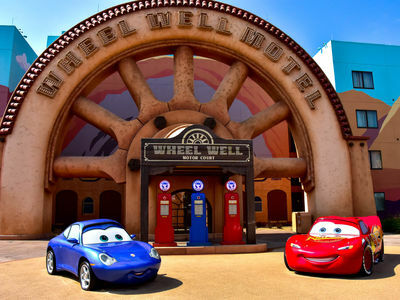 The southern-most buildings in this resort are themed after the movie, Cars. 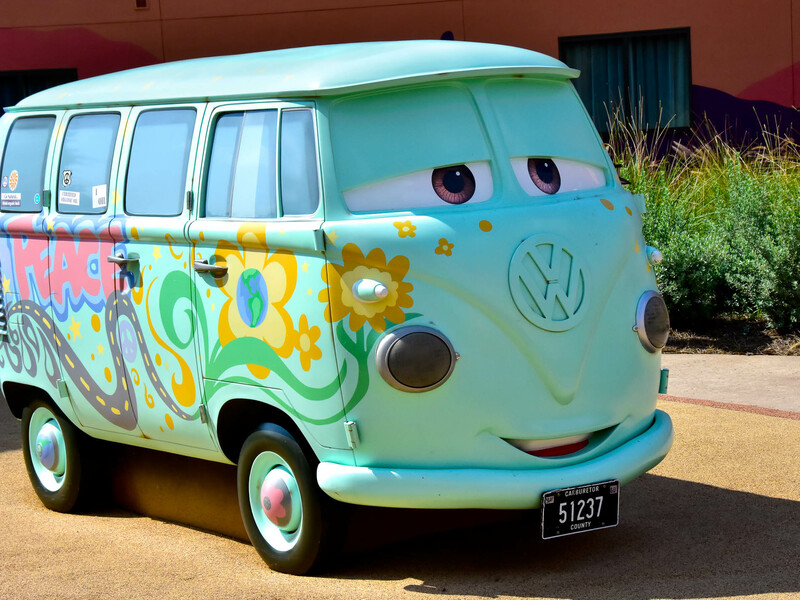 You'll find many of the Cars characters including Mater, the Sheriff, and Fillmore, the hippy VW Microbus. 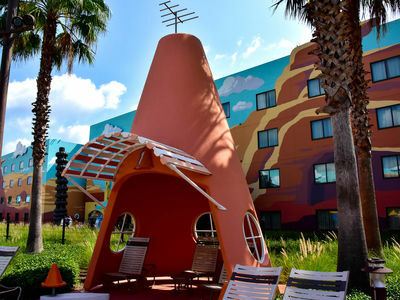 You'll also find the Cozy Cone Pool complete with cabanas that are shaped like, as you might guess, traffic cones. Fillmore's license plate shows the number 51237, which represents the birth date for George Carlin, the first voice of Fillmore. After George Carlin passed in 2008, the voice of Fillmore was taken over by Lloyd Sherr. Photo by Bonnie Fink. Sally Carrera and Lightning McQueen (left to right) are found in front of the Wheel Well Motel, or building 2 in the Cars section. The price of the gas on the pumps behind them shows 29.9 cents per gallon. Photo by Bonnie Fink. The Cozy Cone Pool is a fun place to cool off. It's located in the Cars section of Disney's Art of Animation Resort, just south of the main lobby building, Animation Hall. Photo by Bonnie Fink. If you need some shade there are cones with lounge chairs around the Cozy Cone Pool. Photo by Bonnie Fink. 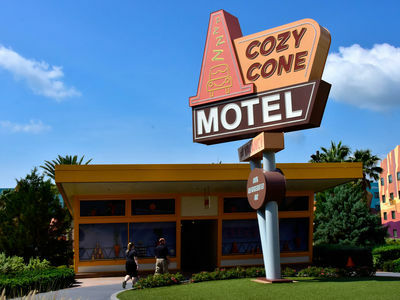 The Cozy Cone Motel is actually the laundry in the "Cars" section of Disney's Art of Animation. 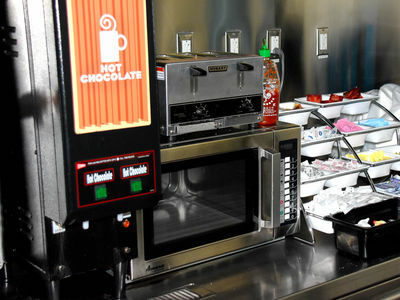 There are also vending machines inside. Photo by Bonnie Fink. 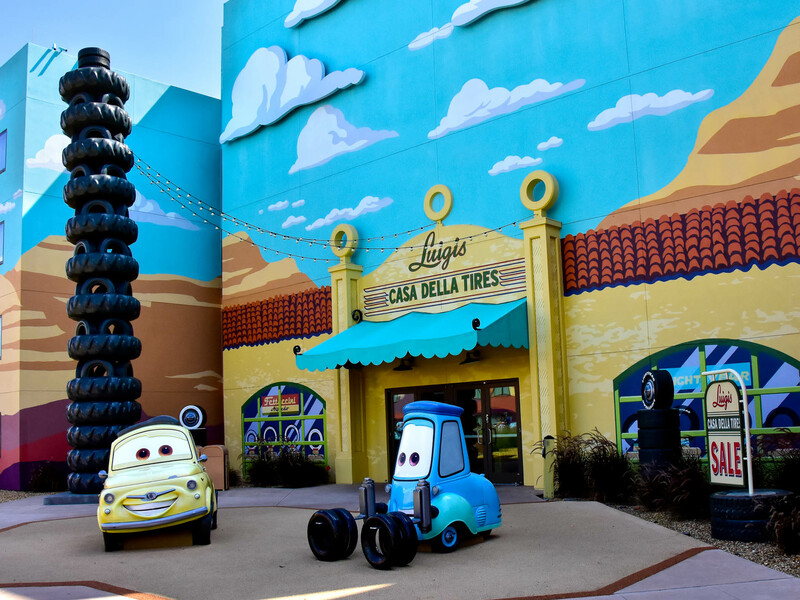 Luigi and Guido (left to right) pose in front of building 3, designed to look like Luigi's tire shop from "Cars." Photo by Bonnie Fink. You can take your picture with Mater. Photo by Bonnie Fink. The Lion King area is the set of buildings just north of Animation Hall. There's no pool in this area, but you will find the Elephant Graveyard, which is a playground for the kiddos. 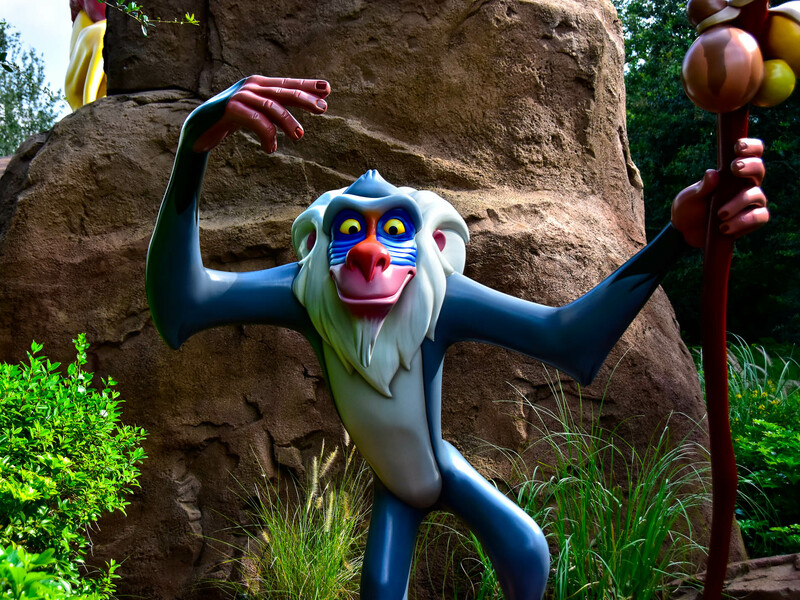 Rafiki can be found in the walkway between "The Lion King" buildings. Photo by Bonnie Fink. Mufasa proudly guards "The Lion King" section. Photo by Bonnie Fink. 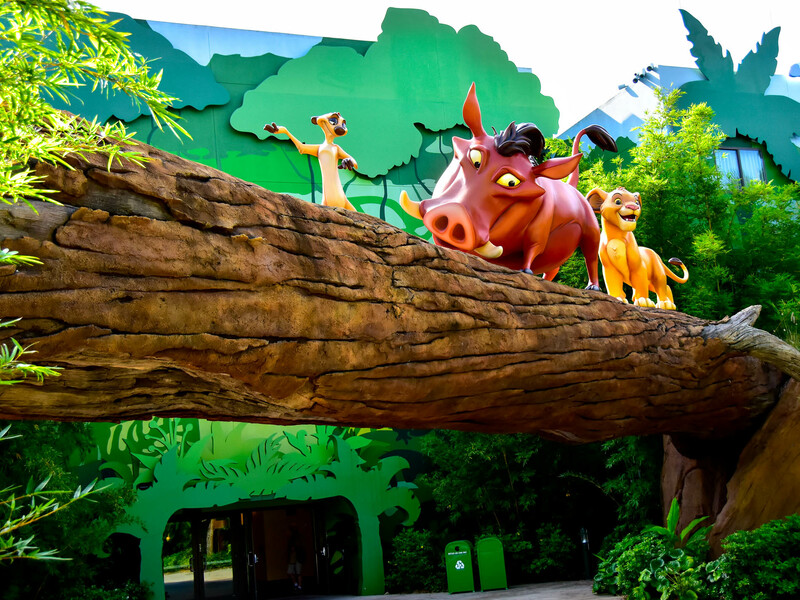 Pumbaa, Timon, and Simba are above the entrance to building 6. Photo by Bonnie Fink. 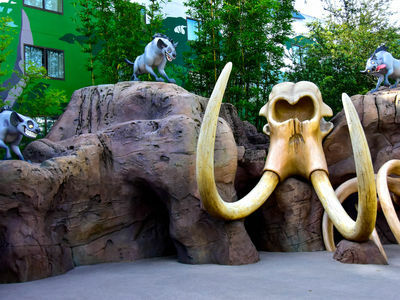 You can also play in the Elephant Graveyard Playground in "The Lion King" section. Photo by Bonnie Fink. 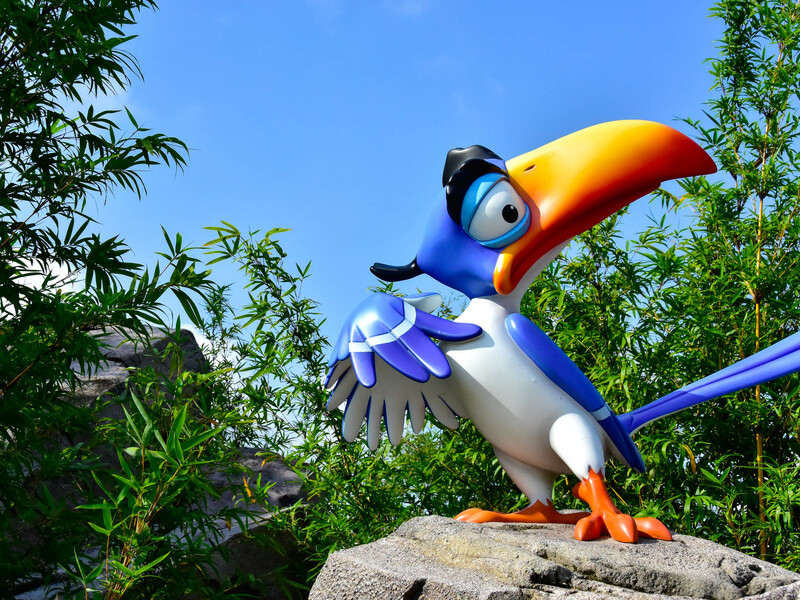 Zazu can be found in "The Lion King" Section. Photo by Bonnie Fink. We've stayed at many—probably most—of the hotels on Disney property over the years. 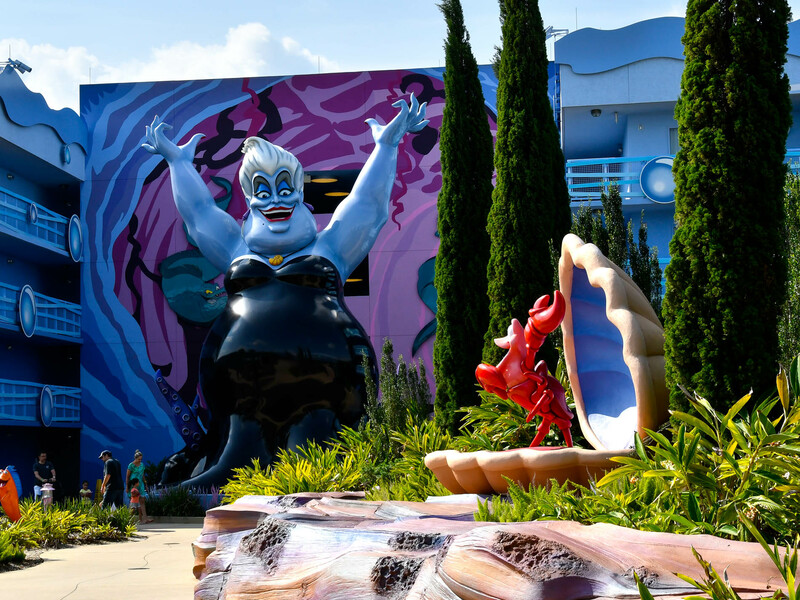 Our favorite is usually just like our favorite park—it's the one we're in at the time—and Disney's Art of Animation Resort is no exception. 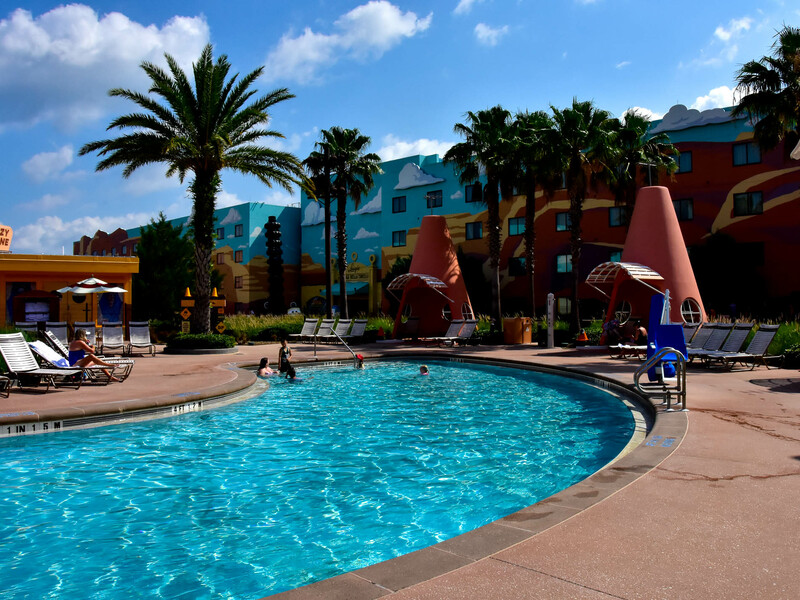 It's a Disney Value hotel, meaning that it has a different look and ambience from a moderate or luxury hotel, but it does so at a significantly lower price. We've managed to find deals at these value resorts when they have sales and booked rooms when their pricing wasn't much different than any ordinary hotel of similar quality off property. We've always enjoyed the stay. 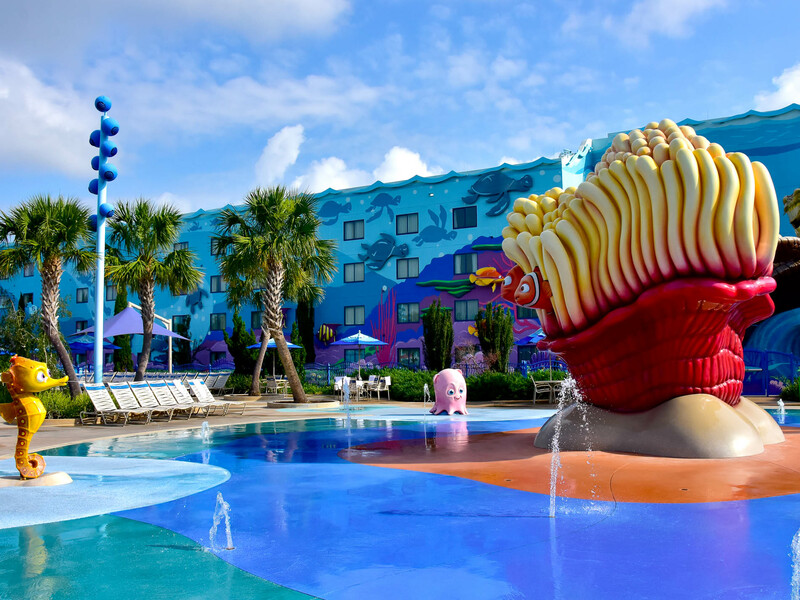 Do we recommend Disney's Art of Animation Resort over other hotels on Disney property? Well, no, we don't. 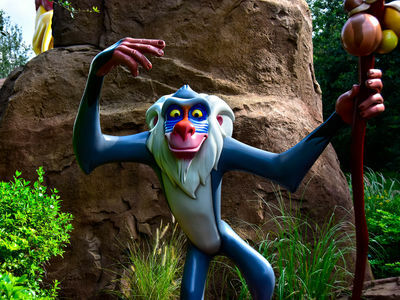 We like pretty much all of the Disney properties, and it simply depends on your taste in hotels, and of course, your budget. 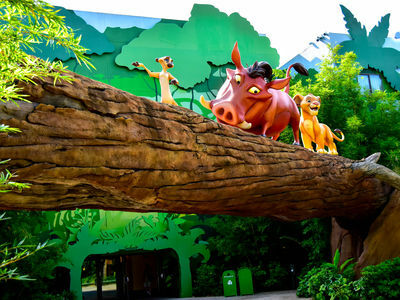 Staying at Disney's Art of Animation is a legitimate Disney experience, just like any other Disney hotel, and especially if you have kids who enjoy a good Disney movie. 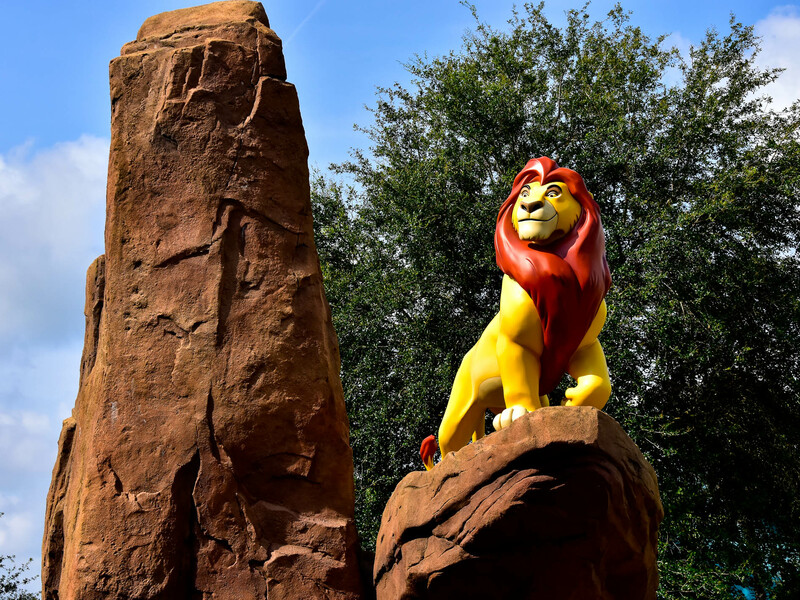 Like Disney's Pop Century Resort, if you have kids with you, we suggest that you do your homework and make sure the kids have recently seen at least one movie from each of the four movie franchises represented here. It will help refresh them and give them a better sense of what they're seeing when they wander the grounds. We posted a photo tour of Disney's Pop Century Resort a while back. You can see the article here if you'd like to compare the two hotels. Join us for a quick walk around Disney's Art of Animation Resort on property at the Walt Disney World Resort in Central Florida. Photos and videos by Donald and Bonnie Fink. Hey Donald and Bonnie! Thank you for this tour. We have been meaning to get over there but haven't made the time yet. Looks pretty cool. I always enjoy reading your stuff and am grateful for you posting it. We as a family have not been to this resort, but on our last trip, we were staying at Pop Century for a night. My mom doesn’t have any sense of direction, and so, when attempting to get from our room in the 1950s to the food court, she disappeared. Luckily, she had her cell phone and we managed to finally meet up. As we were eating, she was asking what the Little Mermaid and Cars had to do with the decades theme of our hotel. Somehow, she had gotten herself so lost that she actually crossed the bridge over to this complex. We got to tease her about that for the rest of the trip. That's pretty funny! 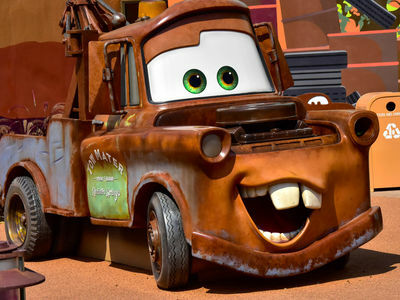 I'd wonder if she didn't just walk the whole path around the lake since she ended up seeing both LM and Cars. LM is pretty close to 50's in reality (maybe even closer than the food court for Pop, depending on which building your room was in- but I'm not sure if the northern connecting path is affected by the construction for the Gondolas). And thanks Donald and Bonnie for posting the tour! I stayed here once in the LM section, but I was only there for a day and didn't wander as far down as the Cars and Nemo sections, so it was good to see that. I have a friend with a family of 5 and he favors the suites here as a really good option for enough beds/bathrooms. Interesting thing on the heritage of the re-purposed buildings, if you look at Google Earth, you can tell that 2 of the LM buildings have the same roof shading as the Pop Century buildings. I'm pretty sure those 2 are the ones that were built before construction was halted on the originally planned Pop expansion. I'm guessing that's also why they kept that section in the same room format as Pop, just building a third building to complete the section when they built it as AoA.